A quick summary of the first three Commandments of Authentic Beauty, as revealed to me by numerous professional pretty people: find your beauty alter-ego, and no product on the market can replace healthy eating and a healthy attitude. This time we’ll look at how the bombshells got the glow by giving the boot to 75€ skin creams (which actually cost about 10€ to produce)and focusing on intense exercise and simplified hair and skincare routines. Regarding exercise, none of this 20 minutes/3x week crap. A minimum of four hours of intense sweating is more like it. And no, yoga and Pilates can’t replace cardio and weight training. They are a complement to, not a replacement for, rejuvenating exercise. Afterwards, go straight to bed. Not only does intense exercise improve blood circulation and sleep quality, it pumps up your libido. Try to find that in a pill! No smoking and no sun, period. Cigarettes age you irreparably. 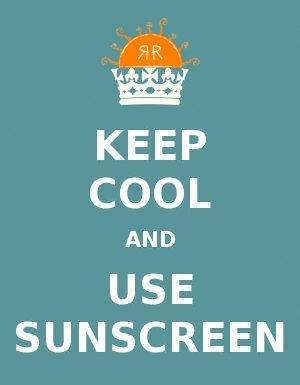 Sunscreen should be as automatic as brushing your teeth, year-round. Anyhow, dark tans have been out forevah. If you crave lightly toasted, try Dove Summer Glow Gradual Tanner (never streaks!). The better your health, the better your skin and the less you need to spackle on makeup. Instead revert to simple skincare and a dermatologist. My skin guru, Dr. Claudia Kenneweg (offices in Sandweiler and Trier), preaches 3 liters of H2O a day and the reasonably priced Neostrata products and peels. My skin looks better now at 44 than it did when I was 22. All the model-slash-actresses I know are faithful to the likes of Dr. Hauschka, Weleda, LaRoche Posay and Avene, never the expensive brands. Every celebrity trainer will tell you lipo is useless. To compensate, the remaining fat cells actually expand, making cellulite even more pronounced. Breast implants will eventually have to be removed, leaving saggy bags, so first try reshaping the upper body with intense weight training of pectoral muscles. By eating fresh fruit and veg instead of Lean Cuisine, dismissing snake oils and unnecessary injections, you should be now able to afford some truly worthwhile and transformative sessions with a personal trainer. Nothing screams desperate more than a fake blonde. And no pitch black hair unless you are auditioning for a Marilyn Manson video. If you have forgotten what your natural color is, report immediately to Beauty Addicts Anonymous. A great coiffeur can take years off you in an hour without committing genetic anarchy. For years I have made a biannual pilgrimage to Pierre Rivet at Brun Andalou in Paris, mecca for European fashionistas. Pierre enhances, never “transforms”, and will prescribe Christophe Robin products (bizarrely, Robin is L’Oreal’s Creative Colorist but his own line is all-natural). Cold turkey the John Freida Frizz Ease. The chemicals in serums et al actually aggravate frizziness. The organic Alverde line at German drugstore DM has a cult following as it’s chemical-free and starts at 2,95€. A water filter in the shower to reduce frizz-causing calcium deposits (www.aqua-techniques.biz) combined with an organic diet can render hair soft and shiny, just like your wee ones. Humans are pretty hard to trick. We notice that your hair color doesn’t match your skin tone and that your gravity-defying breasts and eyebrows were purchased. If feeling attractive is linked to the state of your roots or your bra size, it’s going to be a challenge to ever feel authentically beautiful and truly confident. 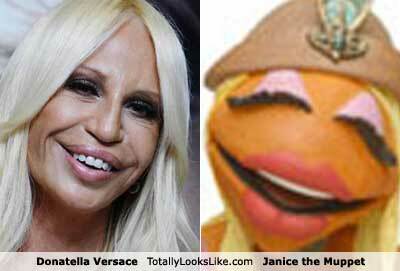 Just take Donatella Versace : (cigarettes) x (tanning) x (plastic surgery) x (fake blonde) = OUCH. Embracing what you were born with doesn’t mean letting it all go. Devoting yourself to a super clean and simple lifestyle takes courage and lots of effort, but it will pay off big. Then it’s just a question of polishing it all up without becoming overly dependent on artificial enhancements. Remember, it isn’t the color of your hair that is important, it’s how you toss it and wink. Sort of an unrelated question: how do you know which language a doctor will speak here in Lux? I’d love to consult your skin guru, but does she speak French or English? Don’t worry, they usually speak all three. My gp, my gyn and my dentist all do. You sort it out in the first seconds of your first appointment, it comes sorta naturally. Ooooh – can I just say one thing? I used “natural tanner” products (Nivea) for a few years and it left my skin with pigment problems. I would soooo not recommend anyone to use them. Rather 10 minutes in the sun – it gives us important D-vitamin as well 🙂 But I totally agree with – don’t over doing it! Great read otherwise! Hi, Dr. Kenneweg speaks perfect English, I don’t think she speaks French. Concerning the pigment problems, it would be quite strange that a self-tanner left them as it is a simple sugar called DHA that “browns” the skin. Hence, like any superficial dye – beets, pomegranate – it washes off gradually. There are even organic versions to try. However, I have read that in using self-tanners, sometimes people forget that their “tan” is fake and forget to wear sunscreen. Also, hormonal changes related to pregnancy, for example, can create pigment problems…plus just plain old age! A dermatologist would be able to determine the origin of the issue.